Theresa May is a “zombie prime minister,” said Andrew Rawnsley in The Observer (U.K.). The early election she called “with the naked purpose of crushing all opposition has instead demolished her own authority.” May sought a strong mandate for a so-called hard Brexit— which would yank Britain out of the European Union’s trade and labor market—saying she’d consider the vote a failure if her ruling Conservative Party lost six seats in Parliament. It ended up losing 13 seats, and with them its parliamentary majority. The Conservatives took 42 percent of the vote last week, just a nose ahead of Labor, which after being written off as a lost cause won 40 percent. 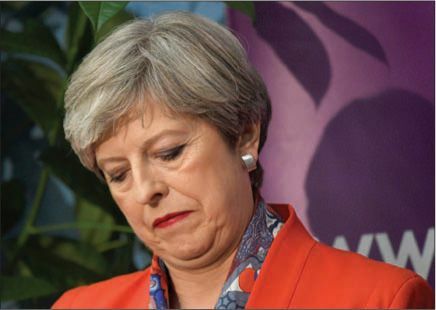 May’s drubbing was a result of her campaign, which “combined vanity with incompetence.” Billed by Conservatives as the second coming of Margaret Thatcher, she appeared robotic in encounters with the public, and had to U-turn on a hugely unpopular manifesto pledge to charge the elderly more for social care—a policy critics called a “dementia tax.” May now hopes to cling to power with a volatile coalition composed of Northern Ireland’s homophobic, anti-abortion Democratic Unionist Party and a Conservative Party that has lost faith in her as leader. It’s only a matter of time before she is replaced as prime minister. The election debacle shows that the Conservatives need a “dramatic reboot,” said The Daily Telegraph (U.K.) in an editorial. May must offer an optimistic explanation of why free-market solutions are better than nanny-state ones. If she can’t manage that, she should make way for a Conservative who can. Negotiations with the EU begin next week, and the country needs a leader who can “sound thrilled by Brexit, not talk of it as if it were a natural disaster.” That’s impossible, because nobody is happy with Brexit, said Fintan O’Toole in The Irish Times (Ireland). Last year’s referendum was narrowly won by the Brexiteers—52 percent to 48—only “with flagrant lies and promises that the U.K. would stay in the single market.” May then hijacked that result to claim “total democratic authority for an extremist coup”—and look what happened. Voters flocked to Labor.